To color or not to color? 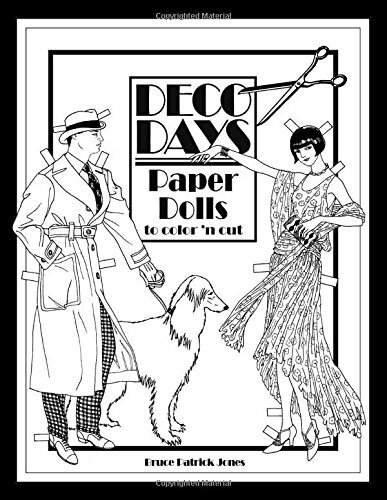 The choice is yours for this handsome Art Deco Paper Doll Coloring Book by Bruce Patrick Jones. Use crayons, colored pencils, paints or markers to colorize the handsome Sheiks and jazzy Flappers. Their wardrobes are extensive and authentic, recalling a bygone era when popular culture was undergoing a dramatic modernization, the result of the advent of Art Deco streamlined design in art, architecture and of course, fashion. This delightful book with 10 dolls plus 37 outfits and accessories will bring hours and hours of coloring fun. Then comes more fun with cutting out the dolls and clothes, dressing them and seeing your own color choices recreate the Art Deco era. If you have any questions about this product by Paper Studio Press, contact us by completing and submitting the form below. If you are looking for a specif part number, please include it with your message.